Two students from DLD College London, part of the Alpha Plus Group, have won prestigious awards at The Royal Borough of Kensington and Chelsea’s Annual Art Awards. Held at Leighton House, students Ziqing Liang and Kaiming Hu were presented their award by the Mayor Mrs Elizabeth Rutherford. The Royal Borough’s Annual Art Competition is now in its 17th year and had an impressive 500 entrants. Art, Sociology, Pure Mathematics and Statistics student, Kaiming, (19), won the ‘City and Guilds Art Prize’, for his large, expressive, oil stick drawing of a city scene on cloth. His prize included a tour of City and Guilds Art College and a day printmaking in its professional printmaking studios. 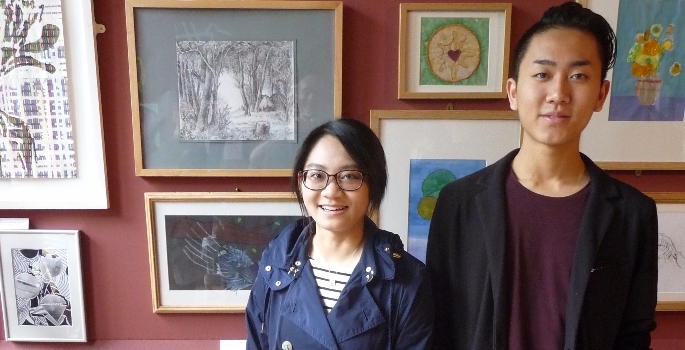 Ziqing Liang, who studies, Art, Physics, Pure Mathematics and Mechanics at DLD won the ‘Highly Commended’ award for her detailed landscape drawing. Art Submissions and Awards Co-ordinator at DLD College London, Jonathan Parkhouse, commented: “It is always a pleasure to celebrate the achievements of our students, and on this occasion it was particularly pleasant to witness the public and official acknowledgement of two our talented art students before the completion of their studies at DLD in the summer. It has been a year of great success for DLD College London’s Art Department as the pass rate for its brand new Art Foundation Diploma Course was 100%.